Country house vacation rental for closed groups - 30/100 guests (for sale or commutation). For spiritual retirement, events, conventions, leisure, vacation, families, day camping, camping, lodging. For exclusive closed groups. Complete structure for up to 100 people. Colonial country style furnishing, comfortable mattresses. Independent chalets with 2 apartments each. Main house: 5 bedrooms, 2 bathrooms, veranda, restaurant and bar (meals for 40 or more people), barbecue, TV room, fireplace, a well equipped kitchen, with 2 stoves, 1 semi-industrial stove, 1 freezer e 2 refrigerators. Swimming pool, kiosk (optionals: heated swimming pool, whirlpool bath, cascade, sauna). Football (soccer) fields, volleyball court, game room, playground. Green and sunny areas, pure air, panoramic view and mountain climate in Araçoiaba da Serra. Catering not included. One hour drive from São Paulo, 650 feet from the main road. Check out on our website below. Little more than 1 hour drive from São Paulo, typical country city, founded by the ?bandeirantes?, the brazilian pioneers. Former muletter stop. Access just 650 feet from the main road. Brazil?s 2nd best climate (Unesco), the sun shines all through the year. Green areas, pure air and mountain climate. 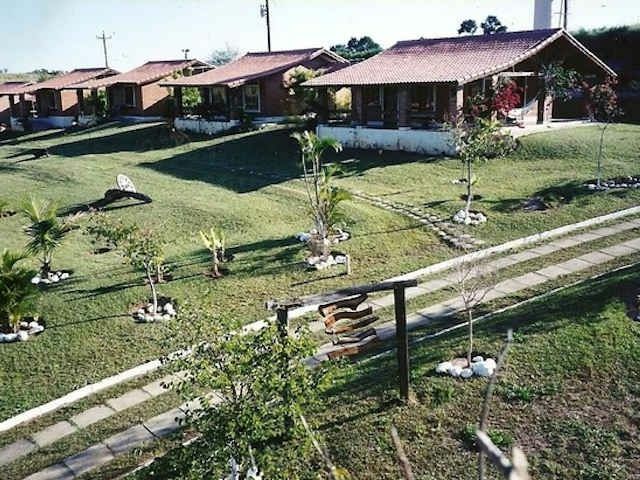 Sighseeing: Ipanema Tropical Forest Reserve (IBAMA), fishing places, stud farm, golf club. Shopping Center and supermarkets, grocery stores and Brazilian barbecue restaurants in the surroundings.